I received this book in audible format from the author in exchange for my honest review. If you, or someone you know, has ever suffered abuse – especially sexual abuse – Not Marked: Finding Hope & Healing After Sexual Abuse should be next on your/their TBR (to be read) list. Mary DeMuth tells all in this book. She suffered horrible abuse, including repeated sexual abuse, as a young girl. In this book she bravely tells her story, not for sympathy, not to glamourize anything, not to shock anyone, but to show God’s strength in her weakness and to encourage others that there IS healing after the incurred shame placed on one’s well-being. Mary DeMuth and her husband, Patrick, narrated the audible version, each telling her story from their standpoint. Patrick met and married Mary long after it all happened, but he learned the hard and emotionally painful way how the abuse left her wounded, distrustful, and shamed. He watched her struggle to find a place of peace and healing for her life. He learned he had to find a way to gently support and encourage her in a loving way however he could, thereby growing in understanding and compassion himself. This is a story of survival, a story of hope and healing, a story of learning to trust in the letting go. 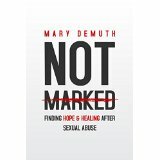 If you like to be read to, I encourage you to purchase the audible version of Mary DeMuth‘s Not Marked: Finding Hope & Healing After Sexual Abuse because this book is well worth the listen. You may find it difficult to hear some parts (as I did) because of Mary’s vulnerability and honesty, but if you stay with it you will be glad you did. NOTE: This book is not for young readers, but parents can use segments of it to warn and advise their children. It can be an opportunity to teach compassion for the many children who have a dark secret of shame, or to encourage one’s children to ask questions when they are unsure about something. You can find Not Marked: Finding Hope & Healing After Sexual Abuse on my BUY THE BOOK! page. This entry was posted in Mostly About Reading, Reviews & Interviews and tagged Book review, Christian encouragement, finding hope after abuse, healing from sexual abuse, help for abuse survivors, Mary DeMuth, ministry resource, Not Marked, sexual abuse. Bookmark the permalink.